By the time I was 13 years old, I had needlepointed enough pillows, eyeglass cases, and checkbook covers to open an Etsy store for eccentric aunts. Somewhere, there are dozens of flat canvases decorated with snoozing dogs, vibrant wildflowers, and pristine winter landscapes. But I had no interest in doing anything with them; I just enjoyed the feeling of making something with my hands. I didn’t know it at the time, but I had developed what crafters Rosemary Davidson and Arzu Tahsin call a “craftfulness” state of mind. Craftfulness celebrates both the art of making and the joy of having made. There’s something incredibly satisfying about working with your hands, whether it’s with paper, fabrics, paint, or clay. 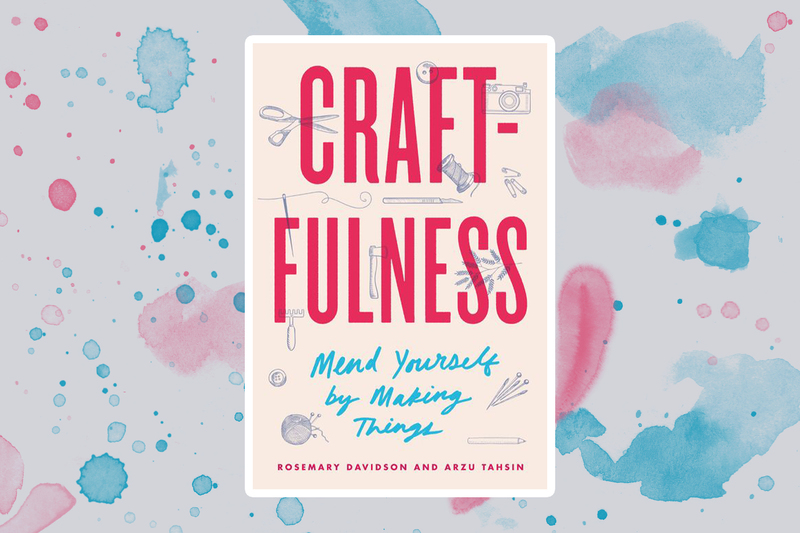 In Craftfulness: Mend Yourself by Making Things, Davidson and Tahsin explore the many benefits of crafting. They compare the process of making to meditation and even therapy, explaining how it gives them energy and enhances their moods. Plus, they encourage you to pick up a craftfulness habit of your own, outlining accessible projects you can start learning today. I spoke with Davidson and Tahsin about crafting and how you, too, can discover the therapeutic benefits of making something with your hands. Trust me: It’s much more satisfying than mindlessly scrolling through your phone. HelloGiggles: Crafting is a fun and relaxing hobby, but it’s also a habit. How often do you craft? Is there value in practicing it consistently? Rosemary Davidson & Arzu Tahsin: For us it definitely is a daily habit, but it never feels like a draconian regime or a chore. On the contrary, it is the tantalizing activity that waits for us when we have finished our work for the day. If we’re not using our hands to make something it feels like an itch that needs to be scratched. While some people might reach for their iPhone or social media apps while watching TV, we reach for a piece of knitting, a sketchbook, or a needle and thread. The urge to make and use our hands is ever-present. HG: What have you learned about life by working with your hands and having an offline, tactile hobby? RD & AT: Well, the wellbeing benefits of not engaging so heavily or constantly [being] online are what keep us healthy. Finding creative expression using your hands is, for us, incredibly satisfying, even if those objects we make are less than perfect. The act of using your hands to express your imagination breeds creativity and productivity in other areas of our lives. Of course, we use social media and we stream Netflix, but these are not our first choices for relaxation. By now, after decades of crafting, we know the difference between zoning out in front of a box-set and being absorbed in a making project. Both bring pleasure but for us, making brings more. HG: On creativity, you write, “Being creative for us is simply the act of making something, using your imagination and your hands as tools to express an idea or an emotion, by producing an object.” Reframing creativity this way makes it a lot less intimidating and much more accessible. RD & AT: We believe everyone is creative. Our hands can translate ideas. They can mold and wield tools and shape garments. They are versatile. Everyone has hands and everyone has an imagination. If you find the thing you love to make, then a world of pleasure will open up to you. The joy and the benefits are in the process of using your hands. Why be intimidated? Who is judging you? This is something you can do for yourself, something that will bring you hours of pleasure. The finished objects, even if they are less than perfect, bear the hallmark of your personality, dedication, and willingness to have a go. HG: How has being craftful seeped into and/or improved other areas of your life? RD & AT: Using your innate creativity in a craft can help to breed positivity in the workplace, [can be] a way of solving problems, and [can help you see] issues in a new light. The confidence gained from starting, focusing on, and completing a project is paramount. HG: You dedicate an entire chapter to how making is good for our mental health. You also open up about personal mental health struggles and how making helps soothe you. RD & AT: Rose went through several debilitating episodes of depression in her life. Making things with her hands concentrated her thoughts; they were less scattered and painful. If you’re feeling hopeless and despairing, the act of making can give you a feeling of resilience and capability: “If I can do that, I can manage other areas of my life.” In the act of making we both enter a state of focused calm which is the goal of mindful meditation. While working on a project, rumination, negative thought patterns, and anxiety abate for a while. But afterwards, the positive feelings linger on; issues that seemed so important and all-consuming find perspective. HG: This hit home for me: “When we begin to make and build pride in our practical ability, we may also start to uncover untapped reserves of inner joy, strength, resilience and talent.” Can you expand on that? RD & AT: For us, very simply, it means that we have the ability to try something new, the determination to master it, and the joy to practice it. Once you have really got hold of the craft you are engaged in, the joy of producing the picture in your mind’s eye is incredible. You made this thing. You followed instructions, improved your skills, and did it again and again and again. How can you not feel proud of your effort, proud of your staying power, and proud of the expression of your creativity? It somehow ignites a spark of confidence in your brain and brings a spring to your step that follows you out into the world and into everyday life. HG: Have you learned anything unexpected from crafting? Has it taken you down any rabbit holes you wouldn’t have explored otherwise? RD & AT: Yes, many. Talking to other crafters in our lives is inspiring. Having enjoyed one or other craft, it has become easy to pick up and try others, many others. Rose, an avid knitter, found herself drawn to the needlecrafts most recently. The love she has for knitting led to an interest and passion for mending things. She is now a student of the Japanese mending arts of boro and sashiko, and she also embarked on any number of workshops on Swiss darning and visible mending art. HG: I have a hunch that people avoid crafting because they don’t feel that they’re artistic, creative, or talented. Do you have to be an expert to form a craft habit? RD & AT: Absolutely not. We’re definitely not experts! All we have are our imaginations, our hands, and a willingness to have a go. Some crafts require a heavier investment in time, materials and other resources, but in learning any new skill, we have found that social media can be your friend. We often YouTube tutorials for techniques or processes, whether it’s knitting, pottery, or bookbinding. HG: Why is now the time for people to form a craft habit? RD & AT: Sadly, mental health issues and anxiety about the state of the world are on the increase. The sense of powerlessness seems particularly acute at the moment, especially amongst the younger generation who are struggling to find a role in society. We are not saying that craft will cure all, but the confidence, sense of achievement, and wellbeing that follow from being craftful helps. HG: Craftfulness outlines a lot of projects: weaving, knitting, pottery, darning. How can someone who doesn’t feel like a crafter get into crafting? Any advice for choosing which direction to start exploring first? RD & AT: We again refer you to a pastime you may have enjoyed or learned earlier in your life. Rose grew up with knitters and dressmakers in her family, so finds herself drawn to textile crafts. Is there someone in your family or social circle who is already practicing a craft you think you might enjoy? Reach out to like-minded people and ask them about their crafts. Enjoy Pinterest, explore the crafters of Instagram, and check out local community classes and drop-in workshops for a taster session. HG: I like to end with this question: What’s your favorite book you’ve read lately? RD: Wanderlust by Rebecca Solnit, a wonderfully eclectic, multi-layered, and digressive history of walking. AT: Mine is Milkman by Anna Burns. Exceptional writing, very moving, and totally absorbing. Nothing to do with crafting at all! 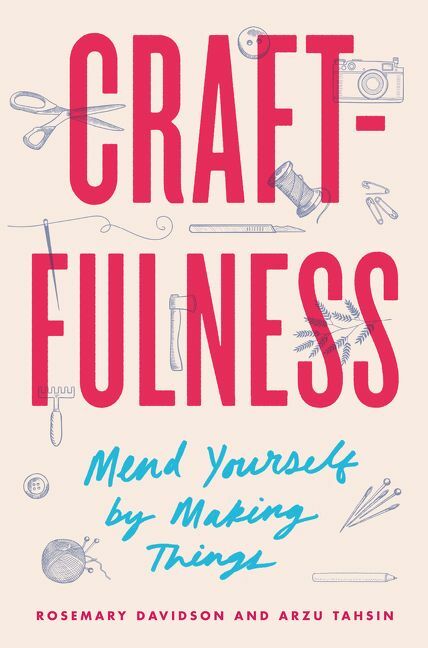 Craftfulness: Mend Yourself by Making Things is available wherever books are sold.